There is tough competition in every business and photography is also not aloof from it. No matter how good photographer you are and how impressive your photography skills maybe, if you will not promote the business in a right manner then you may remain far behind your competitors. If you want your photography business to stand out from the crowd then you should think about taking it one step ahead of your competitors. Here you will get a complete idea about the best methods. Focus on building a unique brand identity for your photography business. To create an unsurpassable brand identity you should work on the aspects like logo designing, creating banners, circulating visiting cards etc. Create a positive and unique brand image that should have a recall value. A distinct business identity will help your organization to get ahead of the competitors. A strong physical identity must include a strong logo as well. But no need to spend money guys, if you like DIY, try Canva to create photography logo for you. In photography business you must clearly identify that who is your target customer. There are different fields in photography like wedding theme photography, still photography, wildlife shoot etc. So, first of all identify your core area of working and then you should approach the right kind of clients that will be interested in your work. Email marketing can do wonders in promoting your photography business. Send the newsletters, service offers, PPTs etc to the target audiences and it will definitely help in increasing the customer base. There are really good email marketing software in the present times that can help you to send bulk emails in a single go. The power of social media platforms like facebook, instagram, twitter etc. is absolutely phenomenal. 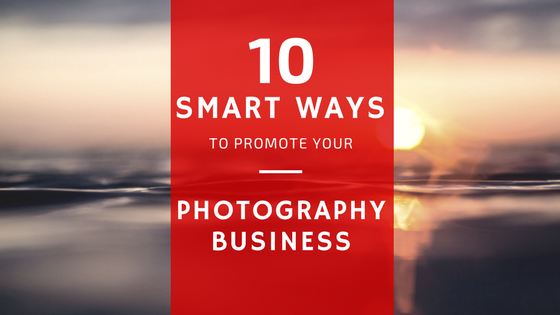 You should spread the word of information about your photography business on these platforms and it will help in attracting a lot of clients. Today everyone is on social media and thus this tactic will surely work in your favor. Read here how you can leverage the power of social media. You should think about building strong partnerships and networking will help a lot in this direction. Share your business information with friends and relatives. Give presentation to the interested parties and potential clients. You can also think about building association with the industry partners. These things will really help in the expansion process and you will reap great benefits in the long run. Portray your work in front of people so that they can appreciate your photography skills. It will help to pour in more business. For this purpose you can organize photography exhibition, you can take part in photography contests, post your work on online platforms that are known in the domain of photography etc. Whenever you receive a positive feedback from the client then share it on your social media pages. You should politely request the client for feedback and testimonials. It will help in connecting with the masses and they will get a genuine and positive affirmation about your work. With the help of blogging you can provide informative knowledge about the field of photography and side by side you can promote your business by sharing the necessary details. It is a great way to connect with the target audiences and will help your business to flourish at a great speed. Starting a blog on Wordpress or Blogger is very easy and can be done within minutes. Make it a priority that your business appears in the online listings. When you search Google then your business information, main address, contact details etc should be visible. You should think about the option of localization which will help your business to appear on Google Maps as well. Positive ratings and reviews will help in improving your listing position on search platforms like Google. Nowadays all businesses are going online and if you really want to surpass the competitors in photography business then think about building a great website. Your website should be impressive, eye catching, informative and with proper contact details. It is one of the best ways to provide business information to the clients. So, these are the best tips that will take your photography business ahead of the competitors. Follow the advice shared here and you will notice impressive results.